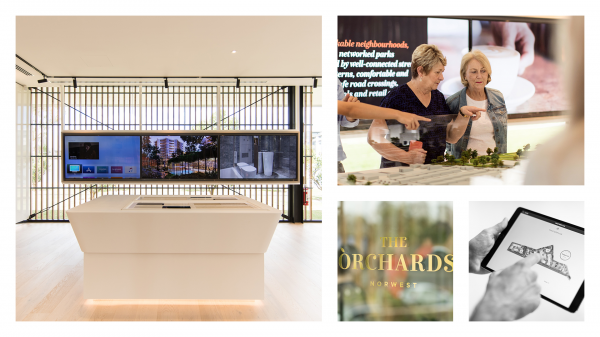 The Orchards is a $1.4B Sekisui House residential, master-planned luxury development in the Norwest, Sydney’s fastest growing region. As the largest of its kind to be introduced to Australia in over a decade, it comprises 7 stages, across 8.8 hectares and will yield 1,300 apartments on completion. 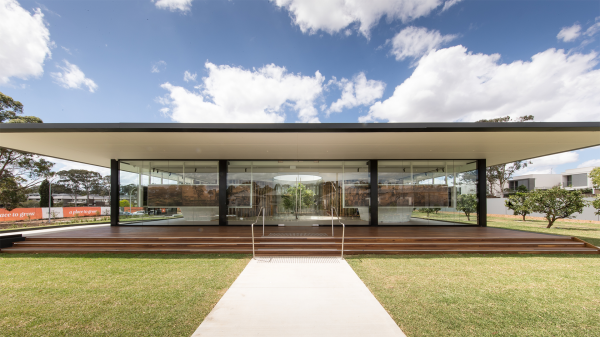 The site’s rich agricultural history as NSW’s ﬁrst orangery established in the early 1800’s, offered a treasure trove of stories that have been thoughtfully integrated into the residential experience. 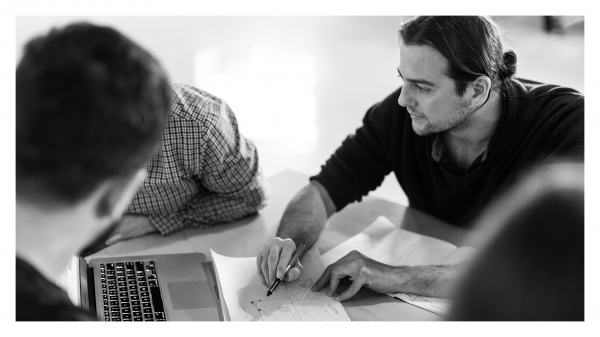 Snepo Research specialises in interactive software across multiple digital platforms. Toast briefed Snepo to develop custom C++ and iOS applications for The Orchards Display Suite. 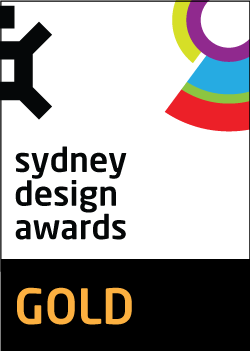 The intention was to create an immersive digital and physical experience that took potential buyers on a personalised sales journey. The digital experience involved over 21 large format screens wrapping around the Display Suite. As potential buyers move from zone to zone they are presented with custom content that can be modified to suit the sales narrative. 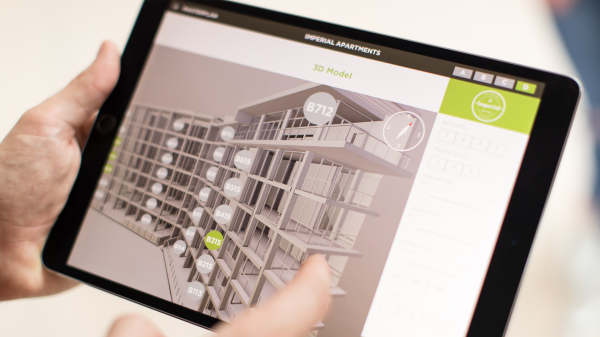 As they move into the Apartment Zone, real-time visuals of the 3D Model can be explored and potential buyers can select relevant apartments to review in more detail. Similarly in the Finishes Zone, sales agents can use interactive content to engage potential buyers with detailed information about what’s available. Importantly, Snepo built a custom web-based CMS to curate the content and capture data to use for sales follow-ups. 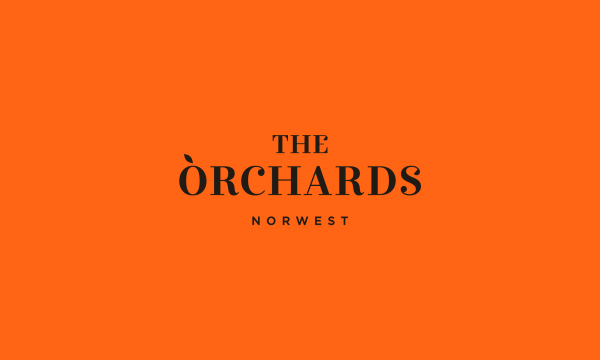 The brand marketing and technology opportunities for The Orchards allowed us to dynamically reactivate the location’s story of agricultural prosperity and build a modern chapter around the narrative of ‘growth’. Retelling the site’s past agricultural stories with the potential of a bright future was a delicate task requiring a careful balance to ensure the user/customer experience remained relevant, useful and helpful at each stage of the buyer journey. The application also, importantly, needed to provide interested buyers with key information about the apartments. Snepo built a bespoke digital platform for Sekisui House that can feed content through to either the triple video wall with three LCD screens and/or function as an apartment browser or finishes selector via iPad. 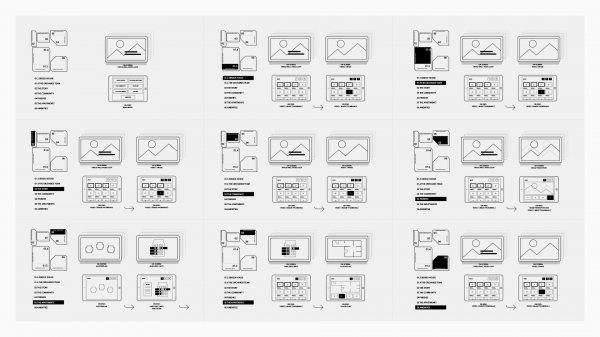 The interface was built based on Toast's design. 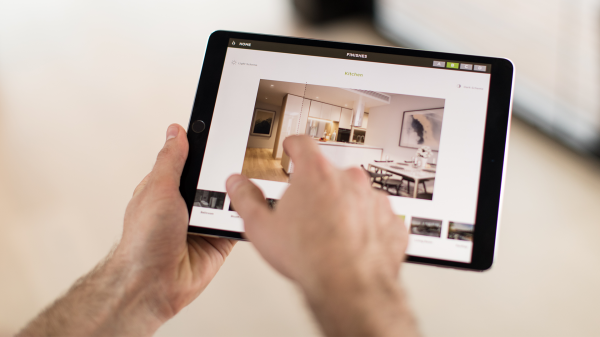 The app features a full digital display suite based on different content zones, an apartment selector to suit customer interests, the flexibility of rotating around a 3D render of a building and the choice of floor-plans and key apartment features. 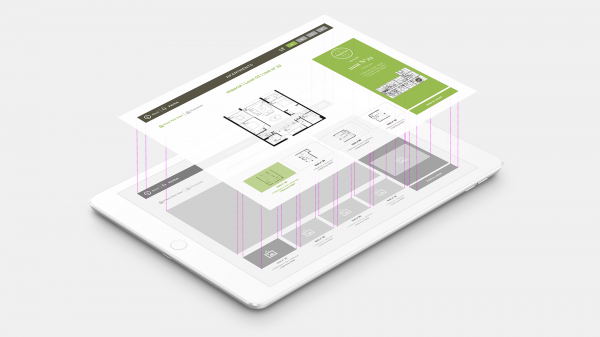 A finishes selector allows sales staff to review finishes and highlight the difference between two renders in one view. (i) Communication layer uses UDP broadcast with OSC, which allows remote control from any device to another one on the same network. (ii) Forked cinder and ported it to run on Apple TV. (iii) Highly optimised 3D renderer for Apple TV. (iv) Same code base running on 5 platforms (Android, Windows, Mac, iOS, TV OS). (v) Bespoke CMS to manage content and sales data. 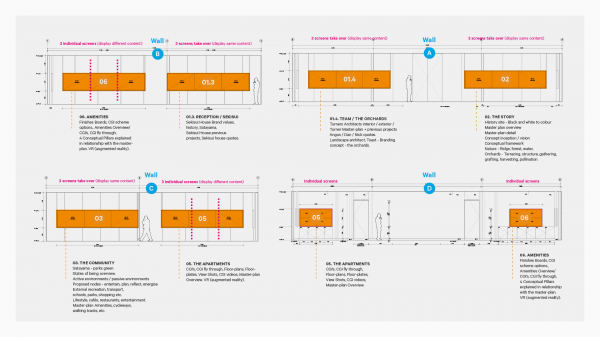 (vi) Staging environment set up for testing. The Orchards marketing and promotional campaign encompassed paid, owned and earned media channels and included hoarding, promotional sales materials, display suite, and community engagement campaigns. The initial sales and marketing/advertising campaign for Stage 1 launched through print media and supported with digital and social media. The display suite opened on October 2017 to registered buyers followed by the public launch. Local and metro press advertisements in Domain and REA in addition to digital and social media campaigns formed the basis for driving enquiry for registration and visitation to the site. 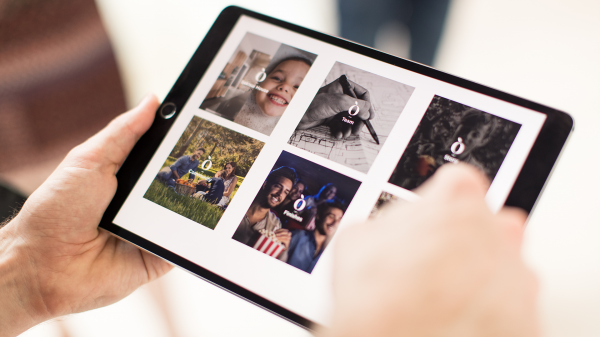 Protected by confidentiality covering all team members The Orchards App uses best practices to ensure all systems are running secure network transfers and private data is encrypted. Personal information submitted to Sekisui House via The Orchards App project is used solely for the purposes of sales and marketing for The Orchards development. It will not be shared, disclosed or sold to third parties. We assure all users that Snepo complies with all laws and data protection policies where the use and protection of data is in question. If you are visiting from the European Union or other regions outside of Australia with laws governing data collection and use, you are agreeing to the transfer of your Personal Information to us. By providing your Personal Information, you consent to any transfer and processing in accordance with this Policy.